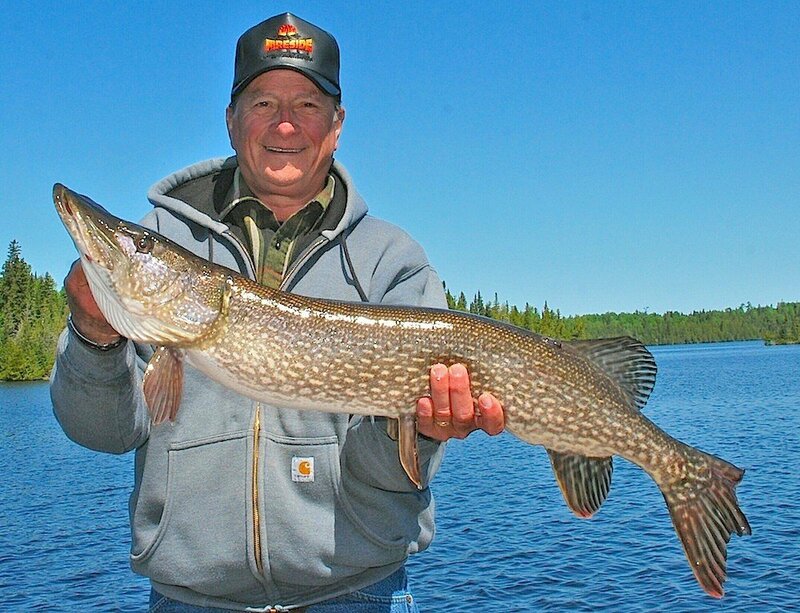 This page is written to give you a better understanding of the different seasonal fishing stages along with Northern Pike movements during each stage on Little Vermilion Lake System throughout our open fishing season, and how Northern Pike reacts during each stage. 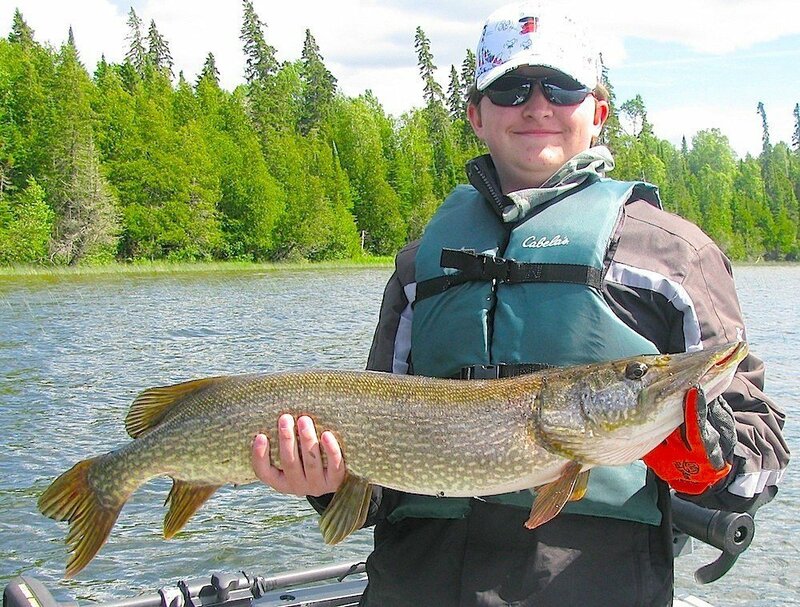 The information below will explain where Northern Pike locate during the different seasonal fishing stages, then applies past knowledge of fishing techniques, lures, flies, and presentations, which have proven to be successful during each seasonal fishing stage. Please read this information and contact us if you have any further questions. 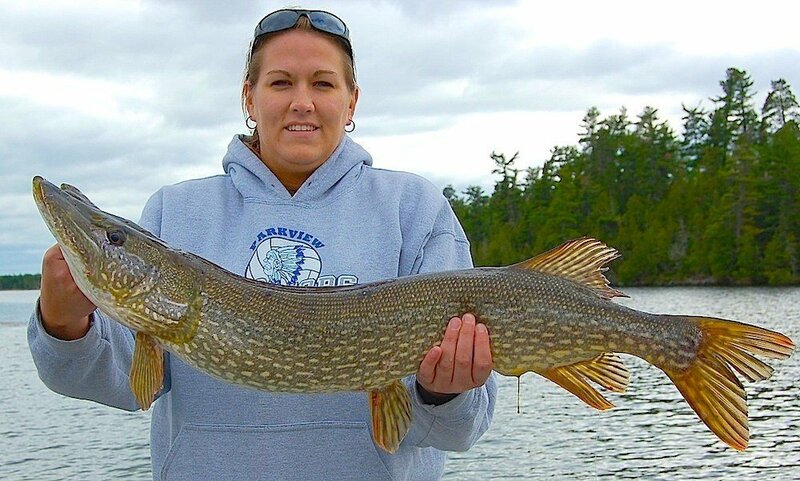 Hopefully after reading the information below you will want to take part in the fabulous Northern Pike Fishing available on Little Vermilion Lake System. Enjoy and hope to hear from you in the near future to help plan your next fishing trip to Canada. Fishing at Fireside Lodge is catch & release, which ensures all guests of Fireside Lodge will have a fabulous fishing experience. Questions? Pre-Spawn Stage: This Stage begins at ice out which normally happens between May 5th to May 10th and continues until the water temperatures reach about 40 degrees Fahrenheit or 5C. Northern Pike during the late winter move to their spawning areas under the ice, which are in shallow dark water bays with good sun exposure, having dark soft bottom and a lot of old standing vegetation from the previous year. A creek flow into the bay makes it an ideal location. The Pre-spawn stage could last 1-3 weeks depending on weather & water temperatures. 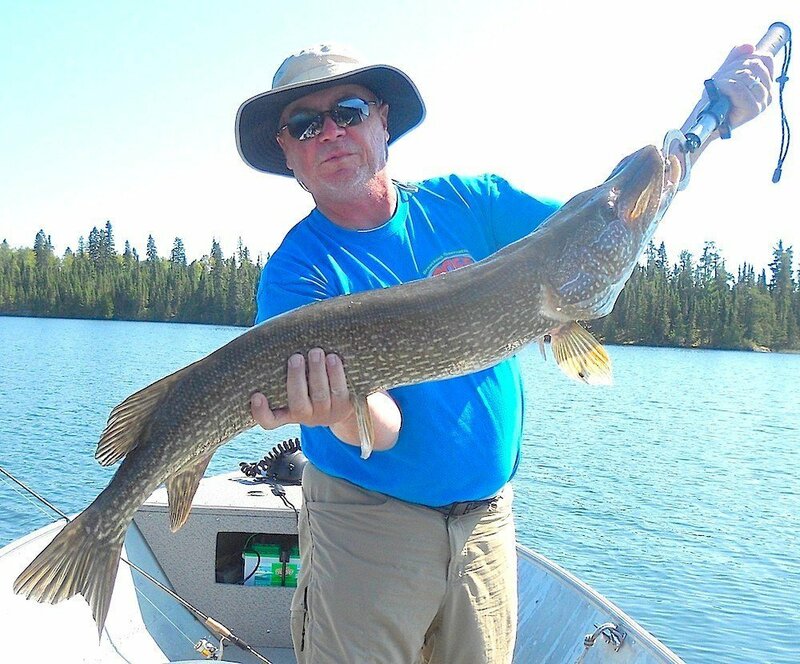 Northern Pike are located throughout the bay near drop offs and subtle structures like a difference in bottom type, fallen trees, rock structures and any other type of bottom change. Pike can be very active at times and sunny warm days which increase the water temperatures seems to activate the Pikes metabolism and triggers feeding. Expect fabulous action, using a variety of lures and flies. Minnow imitating twitch baits, in-line spinners, soft plastics, and spoons work well. A slower or stop and go erratic presentation is best. Smaller to medium lures produce better results. 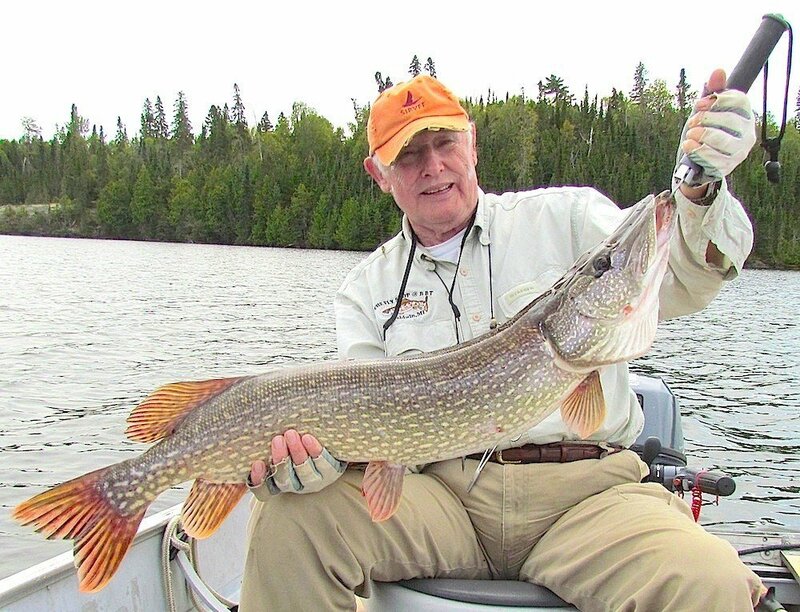 This is a unique time for Fly-Fishers as sight fishing is very possible with calm conditions, and Northern Pike are very receptive to flies and the fly-fishing presentation. Streamers under the surface or a gurgler on the surface, with a slow or pause motion, is hard for Northern Pike to resist. This time of year is dependent on weather and water temperatures, but by paying attention to detail & timing fishing for Northern Pike can be very rewarding during this fishing stage. Done in very shallow water it is possible to see the backs of the fish and the water disturbance as this process takes place. This is done in last years old vegetation, which allows the sticky egg mass to be attached to the vegetation where the eggs can stay off the lake bottom and receive proper oxygen. If the eggs would fall to the lake bottom they get covered in silt where they will not get enough oxygen to hatch. If successful the eggs will hatch in about 14 days and during the first few days the small fry will get nourishment from their yolk sack. Next they feed on plankton, being plentiful among the vegetation, which also provides cover from predators. Fishing at this time can be “Fabulous”, being fast and furious at times. Taking several weeks to complete the spawning process there are groups of fish pre- spawn, spawning, and post spawn at the same time. When the actual act of spawning is taking place Northern Pike are difficult to catch as they are focused on the spawn activity. However the pre-spawn and post spawn fish have very active feeding times, and when they turn on, look out. This amazing act of nature starts when the water temperatures are about 40F or 5C and continues to 50 degrees Fahrenheit or 10C. This stage is all about the water temperatures getting 40F or 5C or above, normally happening anywhere between May 15th to May 31st. Northern Pike spawn during daylight hours in heavily vegetated dark bottom bays by creek inlets when available. The female can be much larger and usually pairs with one or two males. The males swim along side the female, if two males on both sides, vigorously squeezing the females flanks so the eggs come out while simultaneously males are emitting their milt, which fertilizes the eggs. They aggressively hit everything thrown their way. Normally lures & flies are presented at slow to medium speeds; however there can be moments you cannot reel fast enough. 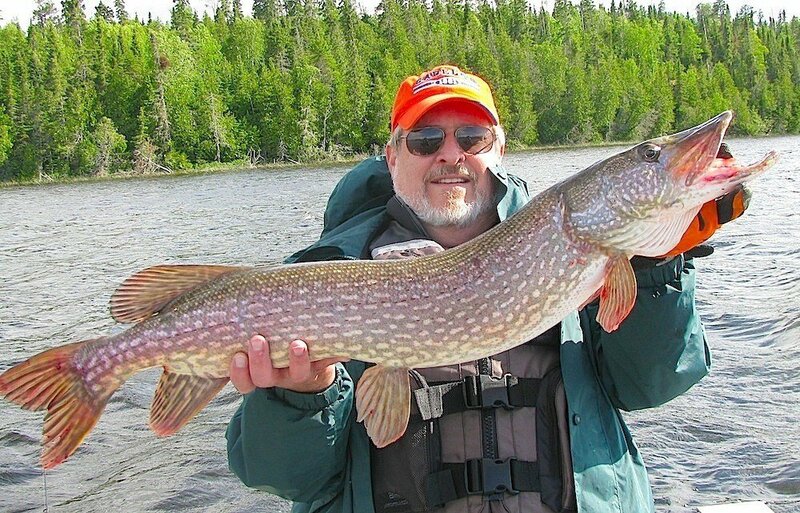 Northern Pike are caught in all sizes, and fishers have a great shot at a Trophy size Northern Pike. Fly-fishers will love this time, as Northern Pike are very active towards fly-fishing techniques and presentations. Also it is a great time to sight fish for these monsters. Lure and fly selection at this time can be a wide variety, however usually medium to small sizes work best. This stage takes place between third week of May to the second week in June. Northern Pike will move out of the spawning areas and start using structures like rocky points, rock shores and reefs as they make movement towards bays which will develop weeds beds first. This happens gradually so some Northern Pike will be staged in or near the spawning areas, while others will be using points and rock shore structure at the same time, while some Pike will have already made there way to bays awaiting the first weed growth, which will bring them plenty of cover and food. The first Northern Pike to arrive in these bays will have no weeds, so they locate on structures like rocks, pencil reeds, islands, mainland points, humps, slight depth changes, and changes in bottom type. As the weeds emerge in various bays, the slightest weed growth will attract baitfish, and the Northern Pike are certain to follow. So one day there is no activity in a bay, however the next day Northern Pike can be heavily populated in that same bay. The biggest bays with good sun exposure produce Pike first. 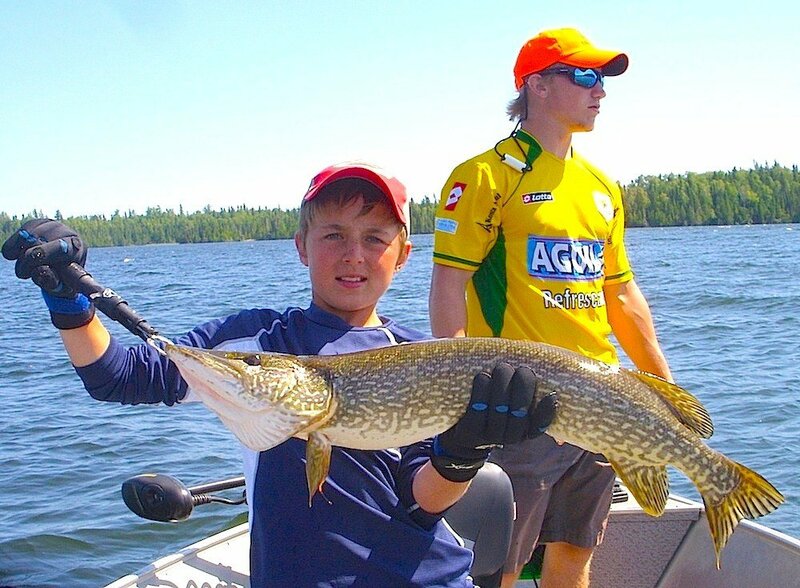 As weeds become more established the population of Kids fishing for Trophy Northern Pike in CanadaNorthern Pike Fishing distributes throughout all the bays. Post-spawn Northern Pike fishing is great for fishers who follow the Northern Pike as they make their movements between structures. Also Pike are hungry from the stress of the spawn, and because their metabolism is increasing with the rising water temperatures. Northern Pike fishing during this stage can be fast and furious at times, however anglers tend to do better with techniques, which are not fast or aggressive. Remember with the water being cold, and Pike being cold-blooded creatures they react fast in warm water and slower when the water is cold. Many lures can be productive, including in-line spinners, suspending / diving minnow imitators with twitching techniques, spoons, and soft plastics. Fly- fishers are successful with steamers in a variety of colors, and at times surface flies can have very exciting results. From the second week in June to the first week in July, is what I call the Early Summer Stage. At this time weed beds become increasingly established in bays, island saddles, flats, shore cut-ins, edges of points, and shoreline dips. Our clear water allows deeper weed beds to develop in bays and flats. These are fish holding magnets, and our lake system contains hundreds of these locations. As the water warms Northern Pike get active and aggressive with their increased metabolism. This is a time where we can start to use larger lures effectively and at times faster retrieves. Lures and flies of any size will work however for those wanting to use their larger arsenal of tackle, this is a time in the season where Pike become receptive to this presentation. Lures that suspend, diving/floating, crank baits, in-line spinners, spinner baits, surface lures, jerk baits, swim baits, plastics, jigs, and various spoons all will be effective. Fly-Fishing presentations of streamers dressed with tinsel, weighted heads, use of sinking tip line, or flies representing white gold tone, perch, sliver blue, red white, orange white, and black works well. Sinking minnow/fish imitators, and bigger poppers also work well. The beginning of July through middle of August identifies this fishing stage for Northern Pike. At the beginning of this stage weeds are well developed and fully grown by the end of July. Weeds are a key to success at this time of year and the deeper weed beds ranging in 8 to 18 foot range will produce a lot of BIG Northern Pike. 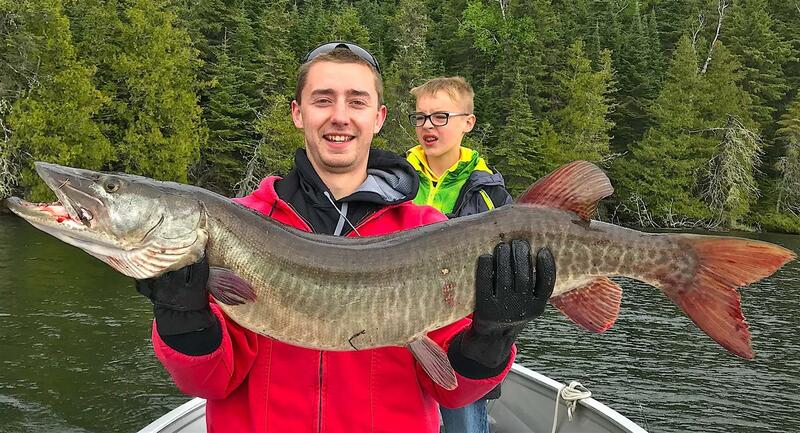 Rock points, reefs, or isolated boulders will hold large Northern Pike also and the best areas are located just outside an established weed-bed, which leads into deep water. During this stage Northern Pike start feeding more often, simply because warmer water temperatures increase their metabolism, which makes their food digest quicker. The good news here is this means increased fishing activity for Northern Pike fisher’s. Even though fish are actively feeding during this stage they will still have neutral/negative feeding times. A good fisher is able to take these slower fishing times and still have some productivity by catching fish. The key here is to size down and use more subtle techniques. 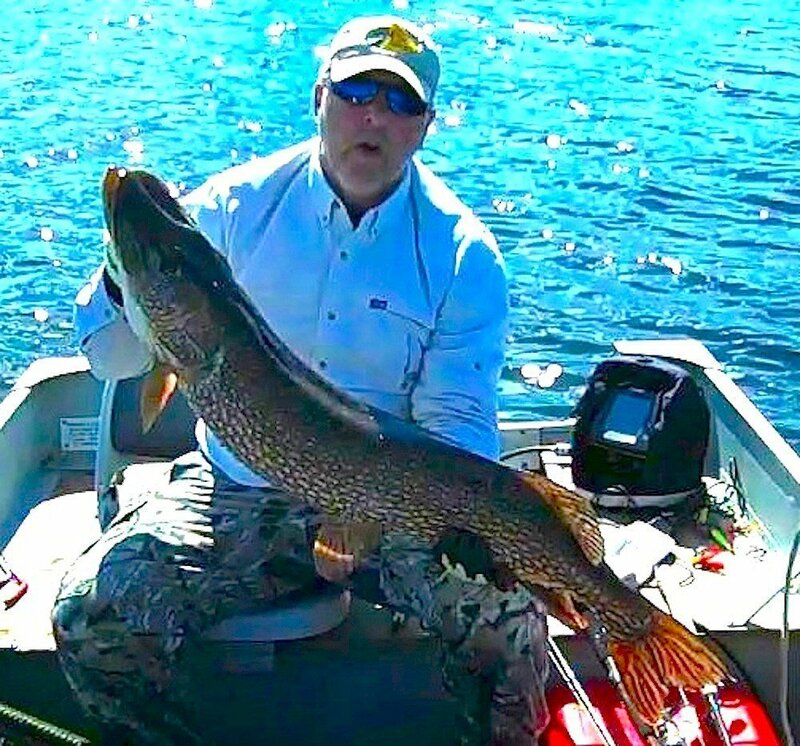 If the Northern Pike bite is aggressive, apply aggressive techniques by using faster presentations lures like jerk baits, burning buck tails, spinner baits, crank baits, surface lures. If the fishing is slow and you think your locations are good change to smaller lures and present them slower. A few examples can be a blue fox spinner or pin type spinner bait retrieved as slow as possible and making the blade fail during the retrieve. Fishing suspending twitching minnow imitating baits, and completely stop the lure for 5 to10 seconds, then give a sudden sideways jerk and let it rest again. For a visual of this presentation method view our fishing video, the long version, on our YouTube channel. Many soft plastics, swim baits used with swimming or jigging techniques will be productive. Spoons with a long jigging motion allowing the spoon to slowly drop back can be very successful. Some guests ask why Northern Pike get into a negative or neutral feeding mood, and why is the smaller subtle presentation better during these times? Best answer is feeding Northern Pike get full just like we do so they are less apt to chase a big meal. However they are opportunists, so put something small and slow moving right in front of there face and they will take the opportunity and eat it like we will eat a snack while not being hungry enough to eat a full meal. So instead of trying to force feed a big meal with a fast presentation you give the Pike a snack and the results are fish being caught. Get it!!!! During this summer stage fly-fishers will find success with varying retrieves using surface gurglers, poppers, divers or using sinking tip line with streamers. This is a terrific time for surface flies or surface lures, as the warmer water creates perfect conditions for a great Northern Pike surface bite. Fly-fishers will find a sinking-tip line helpful for fishing some of the deeper weeds-beds. This stage takes place from the end of August into September. This stage and the Summer Stage are very similar for locating Northern Pike. During this time we experience movement of larger Northern Pike into some of the spring spawning bays, using the outside of the weed beds and deeper weeds close to the spring spawning areas. 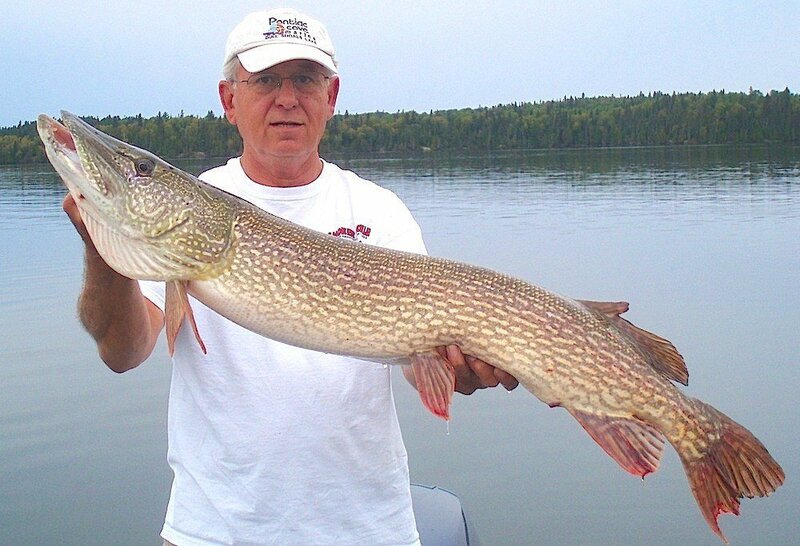 Other locations Trophy Northern Pike can be caught are on rock reefs, and main lake points with deep-water access. Lures, flies, presentations, and techniques used during the Summer Stage are also excellent producers for this Late Summer/Fall Stage of fishing. As this fishing stage progresses and the water goes through cooling and warming a mix of lure sizes and presentations need to be applied by fisher’s. So, if the weather stays summer like, the surface bite will continue, sometimes right through mid-September. If the water cools down more subtle techniques are used, however one warmer day can trigger an aggressive feeding mood. To summarize, fishing will be excellent for those Northern Pike fishers that adjust to the changing conditions. A wide variety of lures, flies, and presentations can be used in a number of different locations. Feeding activity is normally very good as Northern Pike put on weight to get through the winter months. 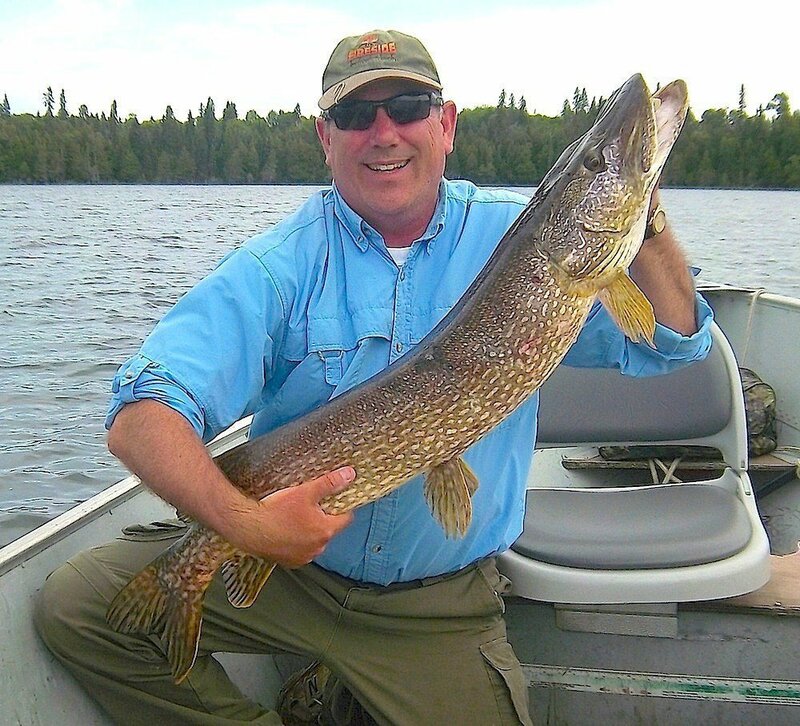 Fishers have an excellent opportunity to catch Trophy Northern Pike during this fishing stage. Fly-fishers will find sink tip line very helpful for fly presentations. 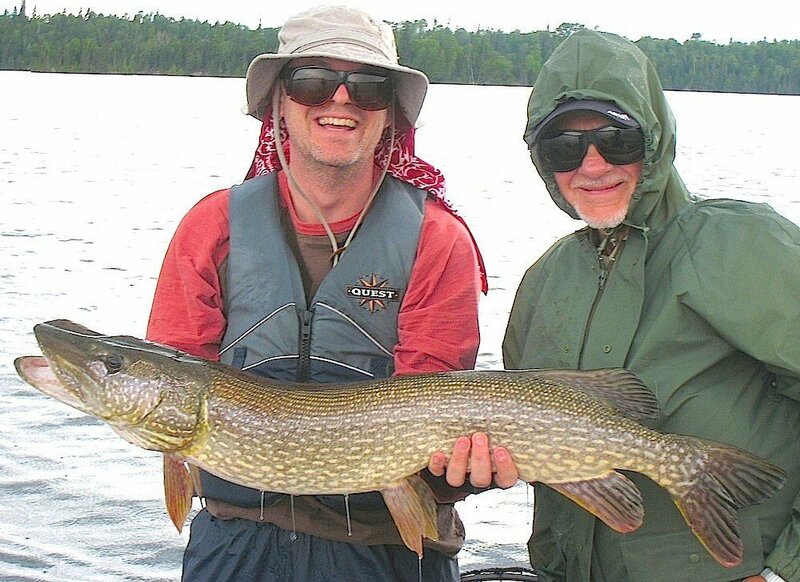 From our Fireside Lodge tackle shop we will keep Fireside Lodge guests informed of fish locations, movements, and changes, which will aid in a successful Northern Pike fishing trip, as good information is the key to fishing success. Note: For information on Fishing Seasons for all fish species, lakes, and special regulations see the fish species page. All Fish Photos were of fish caught and released by a Fireside Lodge Guest.